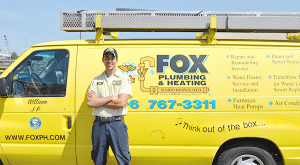 When a bright yellow Fox Plumbing & Heating vehicle pulls up in your driveway, you are guaranteed service from a Plumbing Professional- an expert in the industry. But, even Plumbing Professionals need to earn their title and start somewhere. In April 2014, Fox Plumbing & Heating welcomed a new member to the team: 24-year-old apprentice, Matthew D.
Each day Matt clocks-in with Fox, a new learning experience begins. From waterline installations and repairs to drain cleaning to sewer repair, Matt learns the proper techniques to troubleshoot for clients and gain a wide range of expertise. “I feel more excited because I’m learning something new every day,” Matt said. Prior to becoming part of the Fox team, Matt spent seven years in the hardware-consumer industry. He started out as a basic hire-on, and progressed to assistant store manager for a hardware store. Although the job provided consistency, it became too much of the same routine every day. A couple of his friends were already part of the Fox team, and gave rave reviews on their work environment. 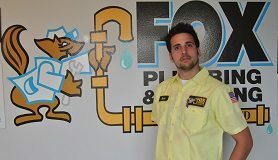 Matt is currently putting in 40 to 45 hours per week shadowing Fox’s Plumbing Professionals in the field. Already holding his apprenticeship card, Matt is working toward becoming a certified Residential Specialty Plumber. According to the Washington State Labor & Industries Department, Matt is required to put in 6,000 hours of work experience prior to earning his certification. After his hours are completed, Matt will endure a three-part examination drilling his new found knowledge on the current Washington State Plumbing Code. He’ll be qualified to complete installs and perform maintenance in all aspects of residential-plumbing repair. Only a month into his training, he’s looking at a four-year learning curve, but he’s not the slightest bit intimidated. Matt is the youth of Fox Plumbing & Heating. A few years from now he’ll be arriving at your doorstep in a yellow Fox van on his own ready to diagnose and resolve your plumbing issues. For now, he’ll stand smiling next to his fellow team members ready to learn his future career. “I’m happy to come to work every day,” Matt said. Since 1964, Fox Plumbing & Heating has been providing superior service to the Greater Seattle Area, and has a reputation to back it. Matt is honing in on his skills with some of the top Plumbing Professionals and Heating & Cooling Specialists, and the customer testimonials can prove it. “Whenever we get done with a job, customers are always extremely impressed with how professional we are,” Matt said. With a longstanding reputation, and a high-customer satisfaction rate, Fox Plumbing & Heating is gearing up Matt to carry on their legacy, and he’s motivated to do so.